I was watching America’s Test Kitchen the other morning (I have the exercise bike set up so I can watch the computer while doing some extra exercise!) and they did a healthy parmesan chicken. 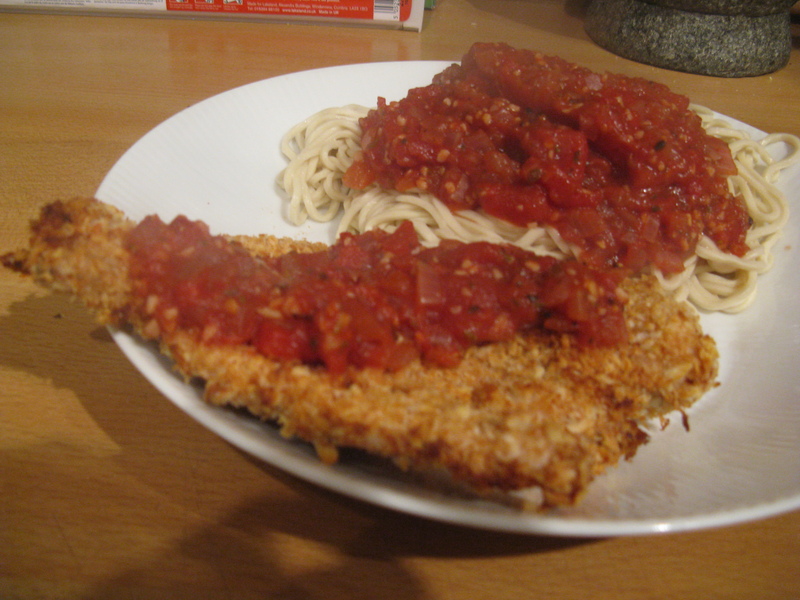 I’d not heard of it before, but it’s pretty simple: chicken breasts rolled in parmesan and panko breadcrumbs, served with spaghetti and a tomato sauce. Thankfully I’ve got their Comfort Food Makeovers book that has the recipe, so we cooked it up this evening, with a few minor changes because their version of healthy still involves oil and mozzarella! I started by making pasta from 2 eggs and twice the mass of 00 pasta flour, although not all of the flour got incorporated. I kneaded this then popped in the fridge in cling film to chill. Then I toasted the panko breadcrumbs to give them some colour and extra flavour. Just popped in a dry frying pan on low heat for a few minutes, stirring occasionally, then letting cool (as it was getting mixed with grated parmesan). The only chicken breasts I could get were very unevenly sized. Thankfully I was able to take the… err… flap part of the larger one and make it into a small piece to add to the smaller one to even things up. I also removed the skin and excess fat. I then put the chicken pieces under cling film and flatted with the base of a saucepan. Then I dried it using paper towels before seasoning with salt & pepper. I mixed the panko with salt, pepper & parmesan, that I grated using our amazing new Microplane grater, with the new back that their customers services sent me for free after I cracked the original one! So: flour in one dish, lightly whisked egg whites in the next (was supposed to have garlic powder in it, but ours had solidified, as had our garlic salt! ), and the panko mix in the last. The chicken went in flour, then, egg whites, then panko mix, then onto a metal rack on a baking tray lined with aluminium foil. Before that went into the oven Soph cooked up a quick tomato sauce. Red onion chopped and softened in a saucepan with lazy garlic. This was seasoned with Italian seasoning, celery salt, black pepper and chilli flakes, and then a can of chopped tomatoes added. This then went on to cook down for 10 minutes before we started the chicken. The chicken got a quick spray with the oil before going in to the oven at 220c fan for 15 minutes, aiming for an internal temperature of 71c. While that cooked I used the pasta gadget to roll out and cut into linguine, which only takes a couple of minutes to cook in boiling water when it’s fresh. However I underestimated the amount of time I’d need to roll it out, so the chicken ended up getting 16 or 17 minutes in the oven before it came out. The chicken registered 75c when we took it out… so I was worried it would be dry. But no time to worry about that at the time, the pasta and sauce needed finishing and plating up! Turns out the chicken wasn’t dry as I’d worried, or at least not with all that tomato sauce on it! The breadcrumbs make it really crispy on the outside, and the parmesan gave it great flavour, although it needed Soph’s spicy tomato sauce to complete the flavour. It took a bit longer than a weeknight meal should, but now I know what I’m doing I’m sure if I did it with dried pasta I could have it done in around 30 minutes. The only thing I’d change next time is I’d like to add some fake bacon bits to the panko mix… but I’m just not able to find them in shops at the moment. I might have to resort to Amazon! I’ve never heard of “panko” breadcrumbs so I’d just use ordinary bread whizzed up in a mixer. Aaaah, right, I checked your link. I might have been making “panko” breadcrumbs without realising it as I often cut off the crusts when crumbing stale bread. We live and learn, as the old saying goes.